A Fun Night for Students, Parents, School Staff, & the Community. 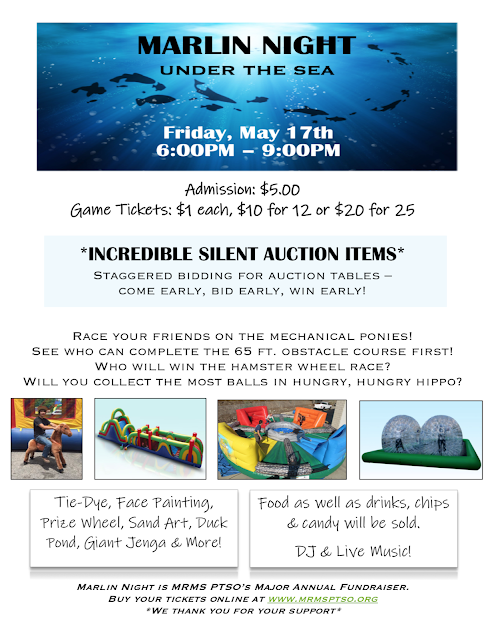 Enjoy dinner with your family and friends, dance and enjoy the DJ's music, play games, enjoy fun inflatables, make memories with pictures in the photo booth, and bid on amazing silent auction items and fun experiences. Enjoy cotton candy, snow cones, popcorn, and bake sale items. This is our MAJOR annual PTSO fundraiser, where there's something for everyone! Parents, guardians, and family can bid in the silent auction to support the school and win some great gifts for upcoming Mother's Day, Father's Day, birthdays, etc. Each school team will be making a themed basket...be at Marlin Night and win one! There's something for everyone at Marlin Night. See you there!